If you live in the United States and have consumed pineapple recently, there is an 80% chance that your pineapple came from Costa Rica. In the EU, it is 73%. Unfortunately, the story of how the pineapple got to your table is likely not as sweet as the pineapple’s taste. In fact, there are many layers of social and environmental issues in that story. The pineapple is a tropical monoculture plant that uses 90% of the land currently under cultivation in Costa Rica. It is affected by major tropical diseases and thus requires very large quantities of pesticides, about 20 kg of active ingredients per hectare per cycle. Though there is oversight of agrochemicals used, the ones currently approved by Costa Rica include some of the most controversial pesticides in the world. These agrochemicals have detrimental effects on pineapple workers and residents in the surrounding communities. Chemical-laden water runoff from pineapple plantations has severely contaminated surrounding aquifers and thus ground water, leaving local residents without a potable water source. Since 2007, more than 6,000 residents of pineapple cultivating communities have been dependent on a tank from a water trunk for their supply due to groundwater contamination, and the water trunk is not well-run on a fixed schedule, often leaving these residents without water. In the town of Cariari on the Caribbean coast of Costa Rica, infant mortality due to birth defects is more than 10%, compared to the country’s overall infant mortality rate of just 0.87%. Furthermore, livestock in these pineapple-cultivating communities are affected; average female pigs will give birth to 9 piglets, of which 5 die of birth defects. Little has been done to address these serious issues. In fact, during a November 2013 forum, Erick Quirós, the senior director of regional operations at the Ministry of Agriculture, left the room when a University of Costa Rica professor posed a question on pineapple cultivation and its repercussions on hydrologic resources. Furthermore, the Costa Rican Institute of Aqueducts and Sewage hid a report on agrochemical water pollution from environmental organizations and the effected population. Due to the economies of scale of the big pineapple exporters, including Chiquita, Del Monte, and Grupo Acon, the last of which is the supplier for Dole, Tesco, Asda, and Fyffes, large plots of land are purchased at high prices from local small holders to construct giant pineapple farms. When exporters enter a community, the small holders are left with the choice between having their field contaminated with large amounts of concentrated pineapple agrochemicals or selling their land for a seemingly attractive price but destabilizing their long-term livelihood. These small holders traditionally cultivate grains such as rice and potatoes. The secretary of health of SITRAP, the main farm workers’ union in Costa Rica, has attributed the global grain shortage and Costa Rica’s increasing food dependency on the invasion of pineapple exporters. Denia Montes, a resident of Buenos Aires de Puntarenas, a region of high pineapple cultivation in Costa Rica, says that the elimination of local grain production has driven up the price of basic staples for the residents as they now have to buy food shipped from other communities or abroad. Yet the salaries paid by pineapple companies usually do not cover these necessities. Additionally, large-scale pineapple production also has led to massive infestation of flies and mosquitoes, severely affecting the health of local livestock and thus the livelihood of small ranchers. Small ranchers are not the only ones harmed by pineapple production. Due to the multiplicity of players in the supply chain, it is relatively easy for pineapple exporters to wash their hands of their responsibility towards the pineapple laborers. This is done through short-term subcontracts. Subcontracting agencies are directly responsible for hiring workers, not the big pineapple exporters. Out of the 7,000 pineapple laborers working for Del Monte, over 5,000 are indirect employees via subcontracts so Del Monte is not responsible for their health and wages. According to Aguiles Rivera, a coordinator at a labor union in southern Costa Rica, a great majority of the pineapple laborers suffer from lower back pain, respiratory conditions, allergies, and asthma linked to agrochemical usage. Pineapple laborers also have very limited collective bargaining rights, with less than 5% of workers belonging to a union. This is due to the fact that over 70% of pineapple laborers are undocumented Nicaraguan migrants who leave their home country due to limited job opportunities and extremely low wages there. Their undocumented status leaves them particularly vulnerable to labor exploitation and deportation threats. Local subcontractors also have a running blacklist to prevent unionized workers from being hired elsewhere. Gender-based discrimination is also common on pineapple fields, because subcontractors prefer men since they don’t take maternity leave and can, on average, work longer in the field. Most women who are hired work in packing plants instead of the fields, and many face sexual harassment from plant managers. 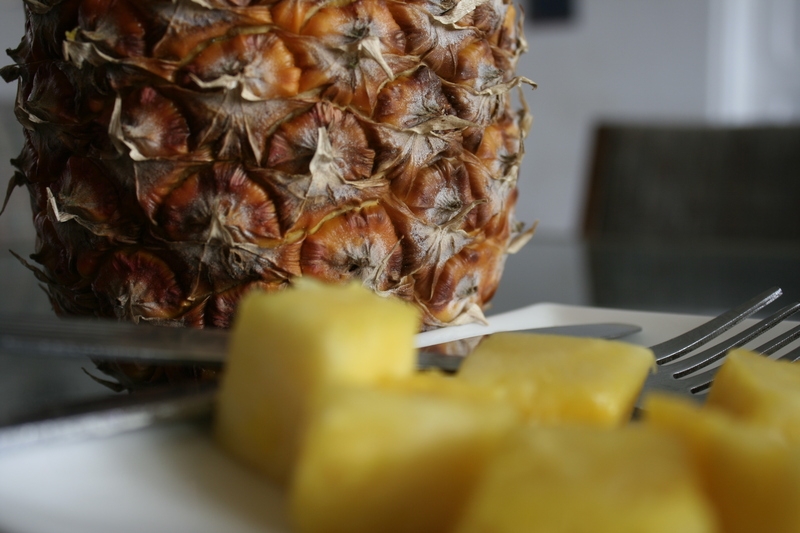 Since pineapple is a tropical fruit, it is difficult to obtain it locally if you don’t live in the tropics. Thus, your consumption incorporates you into the supply and demand chain, a chain that contains labor abuses and environmental contamination that stretch outward to the large global food network. In response to a protest against pineapple farm expansion in the Caribbean communities of Costa Rica in August 2013, Christian Herrera León, the president of The National Chamber of Pineapple Producers and Exporters (CANAPEP), said that contamination from pineapple farms is regularly monitored, because U.S. and European markets demand it, not because of the importance of the health of local residents or concerns for the environment. While that answer sounds discouraging, we should take some hope from it: it means that international pressure counts for something. The interconnectedness of the global food supply means that actions on a small scale have the potential to ripple outward and cause significant changes in harmful practices. Consumers have the power to choose — continue to buy pineapples knowing the destruction they cause to people and the environment or choose a more ethical fruit to force those in power to reform their behavior. Maybe this simple choice will not solve the global food crisis or usher in a new wave of sustainable practices, but it may help those families intricately tied to pineapple production, and make your pineapple taste a little bit sweeter.